Today's card is one I created for this month's Leader's Project Group. I decided to use the Very Vintage Host set (because I love it) and watercolour paper (something I don't use often enough). I added a wash of colour using my aqua painters and ink pads - so quick and easy, especially when you aren't worried about staying within the lines! I really like the colour combination I chose too: Coastal Cabana, Merry Merlot & Gorgeous Grape. A bit of heat embossing, some Clear Wink of Stella for glimmer, a popped-up bee and torn edges - lots going on with this card, yet it went together quite quickly. I can't remember the last time I tore the edges of my cardstock - that was all the rage when I first became a demonstrator YEARS ago! It's fun to do and adds a nice ragged edge. I hope you enjoy today's project! Fold Gorgeous Grape card stock in half to create card base. 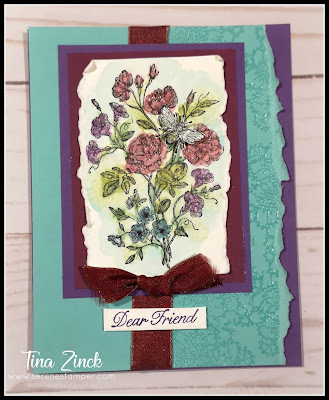 Rub the Embossing Buddy over the right side of the 4” x 5 ¼” piece of Coastal Cabana card stock. Stamp image with Versamark; emboss with Clear Powder. Tear strip towards you along the right side to create a ragged edge. Wrap ribbon around Coastal Cabana card stock, securing into place, and glue to card base. Stamp flower image onto Watercolour Paper with Stazon Ink Pad. Use aqua painters and ink pads to colour. Add Clear Wink of Stella. Lightly add a wash of Coastal Cabana ink around the entire image. Tear left and right sides to create ragged edges. Glue to Merry Merlot card stock, then to Gorgeous Grape layer. Glue to card front. Tie a knot with ribbon and place on card with a glue dot. Stamp sentiment and fly onto scrap piece of watercolour (or vanilla) card stock. Colour fly with aqua painter and ink pads; add Clear Wink of Stella. 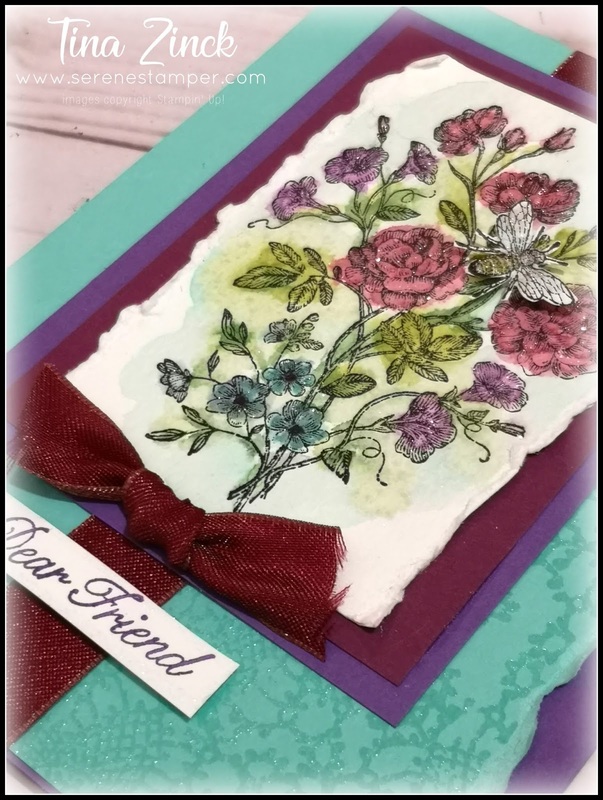 Cut out fly and trim sentiment; apply each to card using Mini Stampin' Dimensionals.